Cold Pursuit is the Hollywood remake of the Norwegian crime thriller/black comedy, Kraftidioten. Both films are directed by Hans Petter Moland, who doesn't lose a step in the English version. A father hellbent on revenge ends up igniting a war between two very different drug lords. The bloody violence, bizarre comic turns, and icy settings make for raucous entertainment. There are several out of left field scenes in Cold Pursuit that caught me totally off-guard. 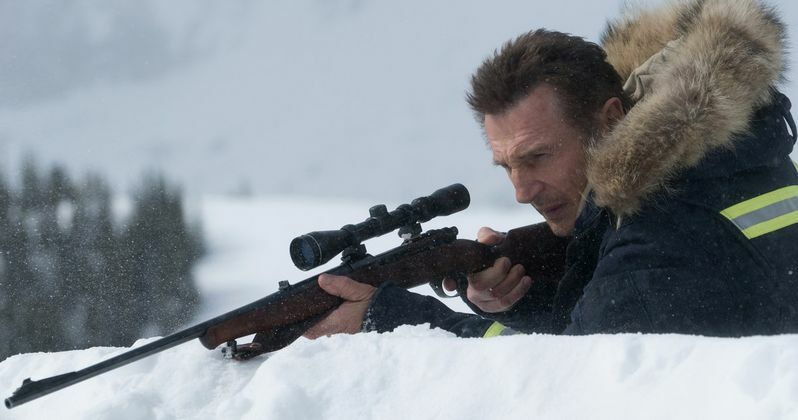 Liam Neeson continues to be an action juggernaut. His character is quite different here, but beats bad guys to a pulp with deft aplomb. Cold Pursuit has too many characters, but is a rewarding fix for the action junkie. Cold Pursuit takes place in snowy Colorado. Liam Neeson stars as Nels Coxman, the snowplow driver of a fictional ski town called Kehoe. He's the average man to a tee. He works hard, has a loving wife (Laura Dern), and an adult son, Kyle (Michael Richardson); who's every bit the blue collar man like his father. Nels takes great pride in plowing the only road into town. The Coxman family is shattered when Kyle is found dead from a heroin overdose in Denver. Nels refuses to believe his son was a drug addict. A missing piece of the puzzle sheds light on the true nature of their ski resort town. Nels decides to avenge his son. He targets Viking (Tom Bateman), a drug lord with a narcissistic personality disorder, and his gang. Viking, who's cadre of goons is hilarious, completely misinterprets where this new threat is coming from. He foolishly makes an enemy of White Bull (Tom Jackson), an Indian gangster who runs Kehoe. It's chaos and murder as the local police (Emmy Rossum, John Doman) try to figure out the body count. Cold Pursuit has a Tarantino feel to the violence. Death comes quickly and mercilessly. Every time a character gets wasted, a card pops up keeping tally. It's odd at first, but makes more sense as the plot unfolds. Every bad guy has a goofy nickname. Eskimo (Arnold Pinnock), a black hitman, earned his moniker by being the only guy from the hood dumb enough to move to the wintry mountains. He's just one of a score of baddies mixed into the fray. You won't remember their names, but will be entertained by their creative demise. The ice, snow, and strange plot twists are reminiscent of the classic Fargo. But this stylistic choice is because of the Norwegian source material. Nels has to plow the road into Kehoe or the characters literally wouldn't be able to move. It's a constant thread that adds to the quirky nature of the film. Liam Neeson is entirely believable as a snowplow driver turned revenge killer. Nels is not the elite assassin from Taken, or federal agent in Non-Stop. His payback is old school, fists and a hunting rifle are capable of serious carnage. Cold Pursuit does become overburdened by the supporting characters and subplots. They are meant to be peculiar and add humor, but are essentially filler. The police detectives are reactionary and one step behind throughout the film. They're not keystone cops, but come close. I did chuckle at their interactions, but they could have easily been cut from the film. Hans Petter Moland gives a lot of screen time to a few odd pairings. He needed to trim these down and keep the focus tighter on the central plot. Cold Pursuit is slightly better than the recent crop of Liam Neeson actioners. The black humor and plot twists add distinction to the rote vengeance theme. Tom Bateman nearly steals the show as Viking. He's a memorable villain. Cold Pursuit is distributed by Summit Entertainment, a subsidiary of Lionsgate.